Dog Aggression - What should I do? Any breed can cause trouble but the bigger breeds can create bigger damage. Its important to recognize the power of a strong breed like the pit bull or the Mastiffs. These dogs are very powerful and can destroy anything in an instant. Remember that these dogs dont dream of being in the news when they grow up. Dogs dont premeditate bad acts like people do. Bad things happen when powerful breeds (or mixes of powerful breeds) live with humans who like the breed but dont understand the animal in the dog. 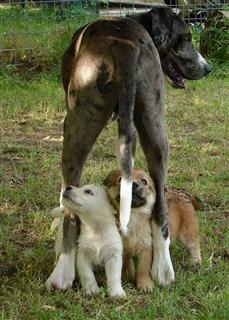 To control a powerful breed you need to become the dogs pack leader and establish rules, boundaries and limitations. You need to fulfill the dog as Nature intended him to be fulfilled. Dogs become aggressive out of frustration and dominance. The frustration comes from a lack of exercise and the dominance comes from a lack of calm, assertive leadership. Physical activity burns the dogs excess energy and maintains his healthy state of mind. This is important because in order to talk to the mind you need to remove the energy from the body. If you live with an aggressive dog, I urge you to find a professional dog trainer to work with you and your dog. Many so-called aggressive dogs can be rehabilitated with time and dedication, and we owe it to our dogs to try. That only gets rid of any guilt or denial you may feel; it doesn't help you get out of the problem that punishment caused. The breed of dog has nothing to do with aggression. Yes, this includes even the breeds that have so recently made headlines for mauling people. Bad training methods are bad training methods. Period. Answer aggression with aggression, and think you'll get a happy, well-adjusted dog? Think again! I've worked with many of the so-called “aggressive” breeds and found them to be wonderfully smart, sweet, and teachable. When I come across a dog who growls at me, I get down and kiss her feet (well, not literally) and thank her for warning me. Punish the dog for giving off a warning and guess what? You won't get warnings anymore—you'll just get a bite. There are many, many causes of aggression, and most of them, if not all, can be corrected. 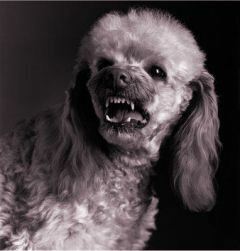 For example, some people who own aggressive dogs may deliberately encourage the dog because they enjoy the feeling of power or of feeling protected. The first step in controlling and preventing aggression is to understand the situations that frequently trigger the aggressive responses in your dog. Once you're aware, don't give your dog the opportunity to practice that behavior by repeatedly putting him in that situation. Although punishment (from humans) may initially suppress aggressive behaviors, dogs learn to mask the early observable (to humans) aggressive signals in order to avoid punishment. Punishment can actually lead to and cause a variety of negative manifestations, including aggression. Read The Negative Spiral of Punishment for Dogs to find out more about how punishment effects your puppy. Remember when I said aggression is a learned behavior? Aggression, from the dog's point of view, keeps the animal safe from danger. If a scary thing appears out of nowhere and startles the dog, the dog aggresses, and the scary thing either goes away or the owner takes the dog away. The aggressive behavior worked and will be repeated the next time the dog is afraid.